Over the course of my research into the Keto diet, I have had the hardest time with one thing: Consuming large amounts of FAT can actually be good for you, even help you LOSE WEIGHT! I’m sorry, but that boggles my mind! 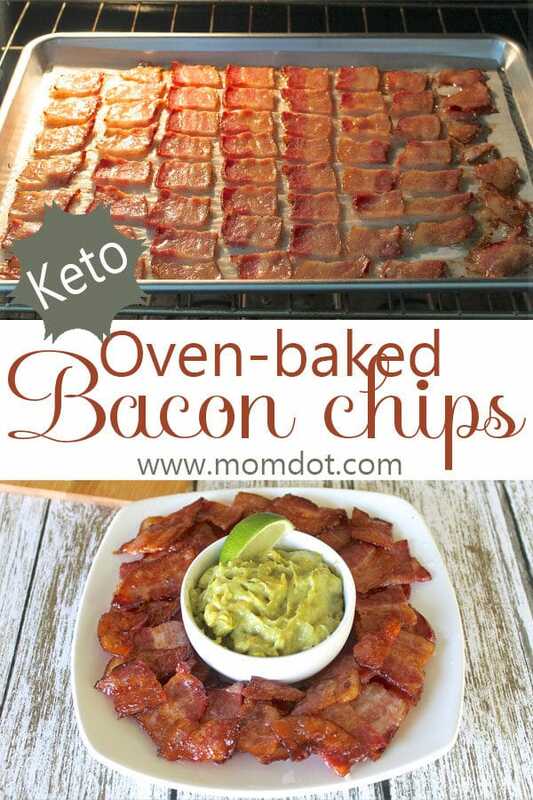 NO WAY would I ever have imagined that I could have Oven-baked Bacon Chips as a snack while trying to lose weight! But as I’ve delved deeper into some of the science, and believe me when I tell you that I’ve read a lot but understand what I would say is very little, I’ve come to see that maybe I have deep-rooted myths that I believed were gospel truths. Like the last few Keto Recipe posts, please remember that I am not a professional. This research is for my own benefit, something that I found interesting but do not for 100% certain know to be scientific or correct, that maybe you’ll find interesting too. I am making small changes to our family’s diet, trying out as many Ketogenic meals and snacks as possible, so that one day I can feel confident to eat it every meal, every snack, every day for real. Here are three myths that I tried out for one week to see if I could naturally curb some of my cravings. This is one that goes right over my head. As one that has never had high cholesterol, and has tried to each very sensibly for as long as I can remember, I haven’t needed to understand as much about the ins-and-outs of cholesterol. I guess you could say that because I’ve never been flagged, I’ve thought my current diet was just fine. However, it did put my mind at ease as I thought about high-fat and my thoughts that too much fat could put me at risk of damaging my heart. *Fat-soluble vitamins need fat in order to be absorbed by the body. Fat is chuck-full of vitamins A, E, and K2. Not only that, but there are added benefits that aren’t widely known. Dietary fats help you maintain your ideal weight by keeping your metabolism balanced and healthy. Reducing carbohydrates while increasing dietary fats lowers blood sugar and insulin levels and helps keep blood sugar stable, resulting in steadier energy and fewer cravings. Fat in the body is created when an overabundance of carbohydrates need to be stored. Additionally, dietary fat consumption keeps you feeling satiated, thus reducing hunger pains to prevent overeating and bingeing. Omega-3 fats help ignite fat-burning genes while turning off the genes that store fat. Furthermore, eating a greater portion of fat allows for the balance of two hormones that make losing fat while maintaining a more lean physique more attainable: Testosterone and Estrogen. This is only possible, however, if you decrease the consumption of carbohydrates as you increase your consumption of fats. One challenge that I saw that really intrigued me, as well as felt super easy, was this: For one week, anytime you crave a high-carb or high-sugar (can you say Reese’s ANYTHING?!) food, have a high-fat snack instead. A few suggestions were: Avocado, a spoonful of sunflower butter or even coconut oil, or a handful of macadamia nuts. Apparently, the cravings for the sugary carbs would subside in under 10 minutes. So I tried it! I cannot say that every time I stopped wishing for, and dreaming of, the chocolatey, peanut buttery goodness in all forms within 10 minutes, but I did find that over time I stopped wishing as often for them. By the end of the week, I maybe thought about that type of snack once per day, and not even that strong. For me, that was huge! I feel like this challenge was a success for me. For the record: I am not a professional. I am giving you information that I’ve compiled through research I’ve read from many different sources of many different topics and facets that fall under the umbrella of Ketogenic Diets. This is not meant to educate as much as it’s meant to give you and understanding as to my own decision to try it, and maybe give you some things to think about for your own use. Nothing more, since I am only sharing what I’ve compiled along with recipes that I’ve tried and LOVE! Here is a snack option that I wouldn’t mind eating every day of my life! I’m so serious, doesn’t that one ingredient look just as easy as purchasing a bag of potato chips?! There is something so doable about one ingredient! And the fact that all you have to do is cut and bake it for a few measly minutes. SO SIMPLE!!! SO DELICIOUS!!! Preheat the oven to 400 degrees F. and line a rimmed baking sheet with parchment paper. A silicone baking mat would also work well as a liner, if you have one. Fan out your bacon strips similar to this for easy cutting. Cut the strips of bacon into roughly 2- inch squares. I actually used my pointer and middle fingers of my left hand as a guide. Pro Tip: Check out our 2018 reviews of the best Kitchen knives, Electric knives, Sushi knives, Chef knives, as well as Knife blocks! Place the cut bacon squares on the prepared baking sheet, leaving a small gap between each chip. Bake the chips until crisp, about 20 minutes. Because my oven tends to cook hot, I checked mine at 15 minutes. I saw a bit of browning on the edges, but I wanted them a bit more crispy, so I was happy with 20 minutes. If you are using a bacon that is not thick-cut, I would think that 15 minutes would be good. Like many things, this time is to your preference. If you like bacon to be super crispy, add a bit more time. I was happy with 20 minutes for this thick-cut bacon. Allow the chips to cool on the baking sheet for 10 minutes. Before transferring the chips to my serving plate, I patted them down with paper towel to soak up some of the excess grease that hadn’t soaked into my parchment paper. Preheat the oven to 400 degrees F. Line a rimmed baking dish with parchment paper. A silicone baking mat would also work well, if you have one. Cut strips of bacon into roughly 2-inch squares. Arrange the chips on the cut bacon squares on the prepared baking sheet, making sure to leave small gaps between each square. Bake the chips until crispy, approximately 20 minutes. If you use a bacon that is not thick-cut, I would say 15 minutes would work. Add additional time if you would like a more crispy chip. Let cool for 10 minutes on the baking sheet before transferring to plate. Serve with hummus or guacamole and ENJOY! I have tried these with a hummus before, so I wanted to try them with something else today. I am so glad I wanted to branch out, because OH MY GOSH these were delicious with the homemade guacamole, also a Keto recipe. Place the avocado, oil, vinegar, lime zest and juice, dried oregano, salt, and pepper in a large bowl. Mash with a potato masher or two forks to the desired consistency. Once mashed, stir in your fresh cilantro and chives. Enjoy! Place avocado, oil, vinegar, lime zest and juice, dried oregano, salt, and pepper in a large bowl. Mash with either a potato masher or two forks to desired consistency. Once mashed, stir in cilantro and chives. Enjoy! More Keto to come, so stay tuned!